Transcription Factor II B (TFIIB) is a general transcription factor that is involved in the formation of the RNA polymerase II preinitiation complex (PIC) and aids in stimulating transcription initiation. TFIIB is localised to the nucleus and provides a platform for PIC formation by binding and stabilising the DNA-TBP (TATA-binding protein) complex and by recruiting RNA polymerase II and other transcription factors. It is encoded by the TFIIB gene. TFIIB is a single 33kDa polypeptide consisting of 316 amino acids. It was originally thought to be essential at all promoters in order to recruit RNA polymerase II and initiate transcription, however recent research has shown that a depletion in TFIIB is not lethal to cells and transcription levels are not significantly affected. This is because over 90% of mammalian promoters do not contain a BRE (B recognition element) or TATA box sequence which are required for TFIIB to bind. In addition to this, TFIIB levels have been shown to fluctuate in different types of cell, and at different points in the cell cycle, supporting the evidence that it is not required for all RNA polymerase II transcription. 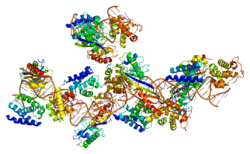 TFIIB is made up of four functional domains: The C terminal core domain; the B linker; the B reader and the amino terminal zinc ribbon. The protease resistant C terminal core stabilises the DNA-TBP complex by interacting with nonspecific sequences either side of the TATA box called the upstream and downstream B recognition elements (BREu and BREd), as well as interacting with the Initiator element (INR). The core domain consists of two alpha helical structures that form nearly identical domains connected by a short linker region and rotated by 90 degrees between each other. Each of the domains has 5 alpha helices with a hydrophobic core. These two domains show a high sequence and structural similarity to cyclin A and are held together by intramolecular hydrophobic forces. The C terminus consists of another short alpha helix and a random coil. The B reader is formed of an alpha helix and mobile loop that is thought to play a role in the identification of the transcription start site. Amino terminal zinc ribbon takes part in the recruitment of RNA polymerase II. The zinc ion is coordinated by cysteine and histidine residues arranged in beta sheets. The DNA is recruited to RNA polymerase II through the B ribbon and it is then positioned by the B core. DNA opening occurs aided by the B linker, the template strand is then placed into the RNA polymerase II cleft and the bubble is stabilised by the B reader (open complex formation). RNA polymerase II and B reader scan the DNA for the Inr in order to position the transcription start site. The first phosphodiester bond is formed. Production of short abortive transcripts due to clashes with the B reader loop. The growth of nascent RNA chain to 12-13 bases leads to ejection of TFIIB due to further clashes with TFIIB. The first transcription factor to bind the DNA is TFIID, which binds via the TBP subunit to the TATA box. TFIIB then binds to stabilize the complex. The binding of TBP to DNA forms a 90° kink in the DNA and allows the TFIIB to clamp the TBP tightly to the DNA. The binding of TFIIB up and downstream of the TATA box strengthens this complex but this binding is not sequence specific as the TFIIB does not come into contact with any of the DNA bases. Instead it uses positively charged basic residues to interact with the negatively charged DNA backbone (the phosphate groups). The basic residues also interact with the acidic C terminal of TBP (the stirrup) and the opposite charges between the TFIIB and DNA-TBP complex stabilises the structure as a whole. There are additional salt bridges, hydrogen bonds and VdW interactions between the TBP stirrup and the TFIIB to further stabilise the structure. TFIIB also directly interacts with TFIIF, another general transcription factor, however it is unclear how TFIIB and TFIIF work together in this mechanism as TFIIB is capable of binding RNA polymerase II both when it is bound to TFIIF and when it is not. Each of the domains in TFIIB interacts with different parts of RNA polymerase II. The amino terminal B ribbon is located on dock domain of RNA polymerase II and extends in to the cleft towards the active site. Extending the B ribbon is the B reader that extends via the RNA exit tunnel to the binding site of the DNA-RNA hybrid and towards the active site. The B linker is the region between the B reader and the B core that is found in the cleft of RNA polymerase II and continues by the rudder and the clamp coiled-coil until it reaches the C terminal B core that is found above the wall of RNA polymerase II. The B reader and the B linker consist of highly conserved residues that are positioned through the RNA polymerase II tunnel towards the active site and ensure tight binding, without these key residues dissociation would occur. These two domains are also thought to adjust the position of some of the more flexible areas of RNA polymerase II to allow for the precise positioning of the DNA and allowing the addition of the new NTPs onto the nascent RNA chain. Upon binding RNA polymerase II, the B reader and B linker cause slight repositioning of the protrusion domain of RNA polymerase II which allows an essential second magnesium ion to bind in the active site. It forms a beta sheet and an ordered loop that helps with the stability of the structure when transcription is initiated. The open and closed conformations refer to the state of the DNA and whether the template strand has been separated from the non-template strand within the PIC. The place at which the DNA opens to form the bubble lies above a tunnel that is lined by the B-core, B-linker and B-reader as well as parts of RNA polymerase II. The B linker is found directly aligned with the point at which the DNA opens and in the open complex it is found between the two DNA strands, suggesting that it has a role in promoter melting, but it does not have a role in the catalytic RNA synthesis. Although TFIIB keeps a similar structure in both conformations some of the intramolecular interactions between the core and the B reader are disrupted upon DNA opening. After DNA melting the Inr must be located on the DNA so the TSS can be identified by the RNA polymerase II and transcription can begin. This is done by passing the DNA through the ‘template tunnel’ and the DNA is scanned, looking for the Inr and placing it in a position that ensures the transcription start site is located in the correct place by the RNA polymerase active site. The B reader of TFIIB is found in the template tunnel and is important in locating the Inr, mutations in the B reader cause the TSS to change and therefore incorrect transcription to occur  (although PIC formation and DNA melting still take place). Yeast are a particularly good example of this alignment as the yeast Inr motif has a strictly conserved A residue at position 28 and in the open complex model a complimentary T residue can be found in the B reader helix. When this T residue is mutated, transcription was significantly less effective emphasizing the role of the B reader. When the RNA transcript reaches 7 nucleotides long, transcription enters the elongation phase, the beginning of which is characterised by the collapsing of the DNA bubble and the ejection of TFIIB. This is thought to be because the nascent RNA clashes with the B linker helix when it is 6 bases long and upon further elongation to 12-13 bases it will clash with the B-reader and B-ribbon leading to dissociation. The DNA duplex also clashes with the B linker above the rudder (caused by rewinding of the DNA into a double helix). TFIIB is phosphorylated at Serine 65 which is found in the B reader domain. Without this phosphorylation, transcription initiation does not occur. It has been suggested that the general transcription factor TFIIH could act as the kinase for this phosphorylation although more evidence is needed to support this. Although TFIIB does not travel with the RNA polymerase II complex along the DNA during elongation, it has been recently suggested that it has a role in gene looping which links the promoter to the terminator of the gene. Gene looping is reliant on the interaction between phosphorylated serine residues found on the C terminal domain of RNA polymerase II and polyadenylation factors. TFIIB is needed for the interaction of promoters with these polyadenylation factors, such as SSu72 and CstF-64. It has also been suggested that both gene loop formation and the collapse of the DNA bubble are a result of TFIIB phosphorylation however it is unclear whether this gene loop formation is a cause or consequence of transcription initiation. RNA polymerase III uses a very similar factor to TFIIB called Brf (TFIIB-related factor) which also contains a conserved zinc ribbon and C terminal core. However the structure diverges in the more flexible linker region although Brf still contains highly conserved sequences in the same positions that the B reader and B linker are found. These conserved regions probably carry out similar functions as the domains in TFIIB. RNA polymerase I does not use a factor that is similar to TFIIB, however it is thought that another unknown factor fulfils the same function. There is no direct homologue for TFIIB in bacterial systems but there are proteins that bind the bacterial polymerase in a similar manner with no sequence similarity. In particular the bacterial protein σ70  contains domains that bind the polymerase at the same points as the B-linker, B-ribbon and B-core. This is especially apparent in the σ 3 region and the region 4 linker which might stabilise the DNA in the polymerase active site. Recent studies have shown that decreased TFIIB levels do not affect transcription levels within cells, this is thought to be partially because over 90% of mammalian promoters do not contain a BRE or TATA box. However it has been shown that TFIIB is vital to the ‘‘in vitro’’ transcription and regulation of the Herpes simplex virus. This is thought to be due to similarity TFIIB has to cyclin A. In order to undergo replication, viruses often stop host cells progression through the cell cycle, using cyclins and other proteins. As TFIIB has a similar structure to cyclin A it has been suggested that depleted levels of TFIIB could have antiviral effects. Studies have shown that the binding of TFIIB to TBP is affected by the length of the polyglutamine tract in TBP. Extended polyglutamine tracts such as those found in neurodegenerative diseases cause increased interaction with TFIIB. This is thought to affect transcription in these diseases as it reduces the availability of TFIIB to other promoters in the brain as the TFIIB is instead interacting with the expanded polyglutamine tracts. ↑ "Diseases that are genetically associated with GTF2B view/edit references on wikidata". ↑ Lewin, Benjamin (2004). Genes VIII. Upper Saddle River, NJ: Pearson Prentice Hall. pp. 636–637. ISBN 0-13-144946-X. ↑ Ha I, Lane WS, Reinberg D (August 1991). "Cloning of a human gene encoding the general transcription initiation factor IIB". Nature. 352 (6337): 689–95. doi:10.1038/352689a0. PMID 1876184. ↑ Heng HH, Xiao H, Shi XM, Greenblatt J, Tsui LC (January 1994). "Genes encoding general initiation factors for RNA polymerase II transcription are dispersed in the human genome". Human Molecular Genetics. 3 (1): 61–4. doi:10.1093/hmg/3.1.61. PMID 8162052. 1 2 Wang Y & Roberts SG (November 2010). "New insights into the role of TFIIB in transcription initiation". Transcription. 1 (3): 126–129. doi:10.4161/trns.1.3.12900. PMC 3023571 . PMID 21326885. 1 2 Gelev V, Zabolotny JM, Lange M, Hiromura M, Yoo SW, Orlando JS, Kushnir A, Horikoshi N, Paquet E, Bachvarov D, Schaffer PA, Usheva A (2014). "A new paradigm for transcription factor TFIIB functionality". Scientific Reports. 4: 3664. doi:10.1038/srep03664. PMC 3895905 . PMID 24441171. 1 2 3 4 5 Kostrewa D, Zeller ME, Armache KJ, Seizl M, Leike K, Thomm M, Cramer P (November 2009). "RNA polymerase II-TFIIB structure and mechanism of transcription initiation". Nature. 462 (7271): 323–30. doi:10.1038/nature08548. PMID 19820686. 1 2 Sainsbury S, Niesser J, Cramer P (January 2013). "Structure and function of the initially transcribing RNA polymerase II-TFIIB complex". Nature. 493 (7432): 437–40. doi:10.1038/nature11715. PMID 23151482. ↑ Weinzierl RO & Wiesler SC (2011). "Revealing the functions of TFIIB". Transcription. 2 (6): 254–7. doi:10.4161/trns.2.6.18076. PMC 3265785 . PMID 22223047. 1 2 Grünberg S, Hahn S (December 2013). "Structural insights into transcription initiation by RNA polymerase II". Trends in Biochemical Sciences. 38 (12): 603–11. doi:10.1016/j.tibs.2013.09.002. PMC 3843768 . PMID 24120742. ↑ He Y, Fang J, Taatjes DJ, Nogales E (March 2013). "Structural visualization of key steps in human transcription initiation". Nature. 495 (7442): 481–6. doi:10.1038/nature11991. PMC 3612373 . PMID 23446344. ↑ Hahn S (November 2009). "Structural biology: New beginnings for transcription". Nature. 462 (7271): 292–3. doi:10.1038/462292a. ↑ Liu X, Bushnell DA, Kornberg RD (December 2011). "Lock and key to transcription: σ-DNA interaction". Cell. 147 (6): 1218–9. doi:10.1016/j.cell.2011.11.033. ↑ Friedman MJ, Shah AG, Fang ZH, Ward EG, Warren ST, Li S, Li XJ (December 2007). "Polyglutamine domain modulates the TBP-TFIIB interaction: implications for its normal function and neurodegeneration". Nature Neuroscience. 10 (12): 1519–28. doi:10.1038/nn2011. PMID 17994014.